If you want to implement some home improvement projects this year that will save you some money and offer a good return on investment (ROI), below are five that I’d highly recommend. I’ll start with the most obvious. If you love your home, give it a treat and put solar PV panels on it this year. The financial ROI is huge. Homeowners, on average, can get a better ROI from going solar than from the S&P 500 stock index (considered a very good investment) in over 25% of states now. The places with the highest ROI from going solar are currently Hawaii, Washington DC, New York, Connecticut, Colorado, Massachusetts, New Mexico, California, South Carolina, and Delaware. But the ROI from going solar is excellent practically all across the United States. Also note that solar panels increase the resale value of your home by thousands of dollar. 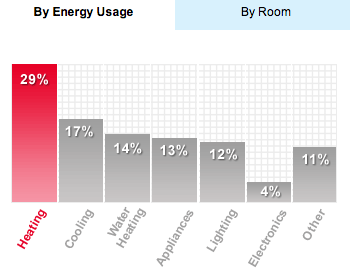 About 29% of the average US home’s energy usage goes to heating the home, while another 17% or so goes to cooling the home. That’s nearly 50% of the average home! One way to cut back on that energy usage a great deal is to make sure you seal and insulate your heating and cooling ducts. These are the ducts that move air to and from your forced air furnace, central air conditioner, or heat pump. Sealing and insulating these ducts these can increase the efficiency of those systems by 20% or even more! That can lead to same massive energy and financial savings. I’m sure you’ve heard this before. Old windows leak warm or cool air (whichever you have inside) like a cereal bowl with a hole in the bottom leaks milk. (Yep, that’s a common line.) In all seriousness, old windows are humongous energy wasters. Upgrading to new windows often offer a great ROI — they can get you your money back via energy savings quicker then nearly any other home improvement project. Of course, this home improvement project will also improve the comfort of your home. This is one that a lot of people probably don’t think about, but it’s big: “the average household spends $400-$600 per year on water heating – making it the second largest energy expenditure behind heating and cooling.” With the right technology alone, you can cut your water heating bill by up to about 50%, or $200 to $300 per year. Solar water heaters are extremely popular and cost effective in some areas. But even if you decide that’s not a good fit for you, there are now super efficient ENERGY STAR-rated water heaters that can save you a boatload (or bathtub-load) of money. So much energy leaks out through the walls, roof, and other parts of your home that you can insulate. Insulation is fairly cheap and very effective at saving energy, so it often has a great ROI. ENERGY STAR has several pages all about insulation (and sealing) that are worth checking out. Have some other home improvement projects that offer an excellent ROI? Drop a note in the comments below.